Creek bends, shallow flats, Inlets, docks and creek mouths, what do these areas have in common? Flounder, it’s that time of year when water temperatures (68 degrees) dictate flounder activity and the annual flounder run starts. It’s fairly simple fishing as using a ¼ ounce Slayer Jig head with a finger mullet or mud minnow slowly dragged across the bottom. Other simple rigs consist of using split shots or an egg sinker (fish finder rig) and 14 inches of leader with a 3/0 Daiichi D16Z Octopus wide hook. For artificial applications any jig head and soft plastic combo (Z-man Paddle Tail) works well in deep water areas. Spoons, soft plastics and hard baits fished on shallow sandbars will produce flatties as well. Flounder strikes or “thumps” as I like to call it are very distinct to other inshore game fish. When fishing for flounder patience pays a great part after feeling the “thump”. Flounder will grab a hold of your bait and sit on the bottom till bait stops moving around and that’s when the flounder will turn mullet or mud minnow around and swallow it head first which will initiate the second “thump”. Many “Old Salt” flounder anglers know the importance of feeling for flounder on the line by slowly lifting the rod tip to make sure the flounder is still attached to the line and then give some slack for about a minute before setting the hook. 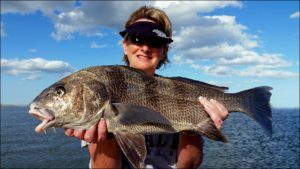 Trout fisherman will get their limit and more using float rigs at Matanzas Inlet with shrimp being the top bait. The last 2 hours of outgoing tide and first of incoming is the locals preferred time to fish. Topwater plugs like a Spook Jr., Rapala or Mirrorlure can catch the biggest trout looking for a bite in the shallows or ICW drop offs at creek mouths. When the bite slows down on top switch gears to diving plugs like a Sebile Stick Shadd or curly tail grubs with a ¼ ounce Slayer jig. Redfish will start to huddle in masses and seek the warmth of oyster beds during afternoon high tides. Long casting spoons or jerkbaits will produce. 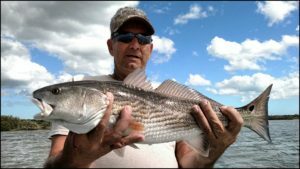 For scattered redfish live or cut mullet on a fish finder rig tossed around points, creek mouths or oysters will do the trick. During low tides look for reds cruising shallow mud banks with their backs out of the water chasing small grass shrimp. 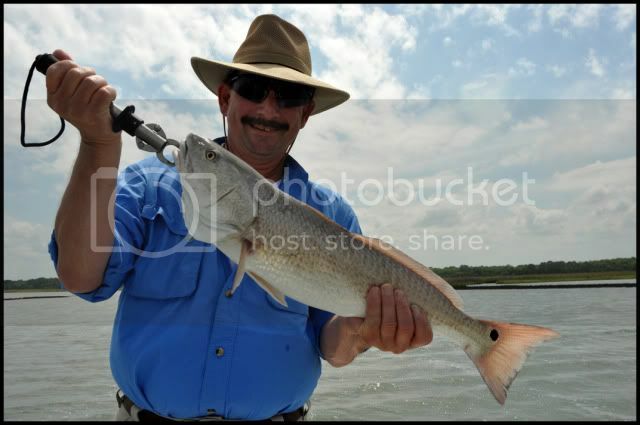 Matching the hatch (live shrimp) or a FishBites shrimp on a weedless hook tossed in front of a belly crawling redfish will result in a catch. When you hear the word “Tarpon” the images that come to mind are the 100 plus pound Silver Kings leaping out of the water thrashing about trying to free themselves. Tarpon are not born as these massive strong fish that test our equipment and angling skills but are born as a small larvae that grow in the back water estuaries for the first few years of their lives till their big enough to join the migration. While maturing in the backwaters these “juveniles” can be caught on light tackle, although not tackle bruisers they will pull and display a nice aerial display like no other. Fishing for juvenile tarpon is most affective through out the summer months although they inhabit our northeast coastal region year round. What separates tarpon from other species is its ability to live in low oxygenated waters that contributes to the tarpon “roll’. During summer months the warm waters and low oxygen during low light conditions get tarpon rolling and make it a sight fishing opportunity. It’s commonly said rolling tarpon are happy tarpon and for every tarpon you see roll there are 10 below it, now these statements might be true sometimes but not all the time because I know through personal frustrating experience that not all tarpon that roll are on the feed. There are certain factors that I noticed that would turn a tarpon with a small appetite into a feeding machine and that is weather and bait. I prefer to tangle with the silver king during lower light conditions in the morning or evening over bright sunny skies in the mid afternoon but with the afternoon thunderstorms Florida is known for, an epic bite can turn on like a light switch when the dark clouds appear and you can smell the rain. When it comes to juvenile tarpon tackle, your standard inshore gear will suffice, I personally prefer 7ft. medium heavy rod with an 3000 series reel lined with 15lb. Power Pro braided line . My first step in rigging is attaching a 36 inch piece of 20-30lb Fluorocarbon leader with a improved Albright knot or any other leader to line knot you like to use. The next step is my shock leader that is usually a 20-inch piece of 40lb. Fluorocarbon bite tippet that ends with a 1/0 Daiichi octopus hook that is snelled. Know that you have your rods and gear in check, you are on the spot and the fish are rolling, what know? If live bait is your thing, I would go with a large shrimp, I buy the biggest ones I can find. The reason I like shrimp over any other bait for juvenile tarpon is shrimp do not have the tendency to flee as quickly as a mullet or other baitfish. My second go to setup if large shrimp are scarce is a big mud minnow under a popping cork. Tarpon have different styles of rolls and according to how a tarpon rolls is how you will present the bait. If a tarpon rolls in a very slow and lazy manner where he sits high in the water column in the same spot for several seconds a cast that is about a foot in front would be the best presentation. Now I don’t mean to literally hit him on the head but a few inches in front of him will normally do the job. When tarpon roll a little faster I choose to lead them by 5 ft. or so in the direction they are heading. Normally with a faster roll a tarpon will propel himself his body length within a second so leading him by his body length will insure your not casting on his back. And finally when a tarpon comes to the surface real fast and kicks hard that means they are sitting on the bottom and I usually add some split shot to my offerings and cast some where in the vicinity of the fish. After the cast I will let out a few more feet of line and raise the rod tip to take most of the slack out, once slack is out I will slowly lower it letting the shrimp sink to the tarpon’s level and wait for the take. The bite will normally come within the first 5 seconds or so and if no take is felt I will slowly retrieve the shrimp back to the skiff. I always keep the bail open and ready to fire when I see a tarpon and again once the proper cast is made I count down to the take 1 one thousand, 2 one thousand etc… and then I feel the shrimp start to kick and squirm knowing that its about to become a meal and then it happens, the line goes tight. The first 5 seconds of the fight are the most important, as line starts to peel off the reel and at that moment I will start to tighten the drag and pay careful attention to “ bow to the king” as most juvenile tarpon will become air borne several times. The rest is up to you now that you’re hooked up and the fight is on, most juveniles will quit with in minutes or lay on their side for the release. 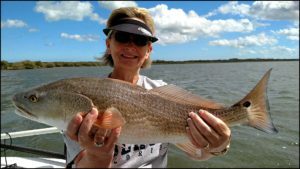 St. Augustine Fishing Report 5/5/11 Redfish bite heats up…..
despite the winds howling at 15+ miles an hour out of the Northeast but that didn’t stop us from catching redfish today. 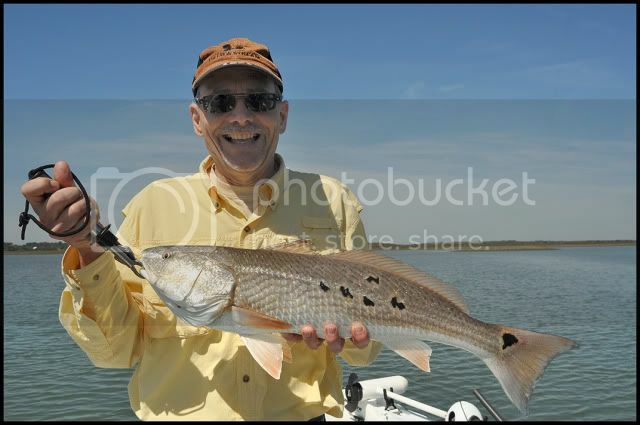 John and Stephen were my guest as we set out to fish St. Augustine in search of redfish on the shallow flats. We started catching fish right away with a few upper slot reds and a nice trout using cut bait on a Daiichi 3/0 circle hook and bb split shot. Once the tide bottomed out we headed to a honey hole that produced an upper to over slot redfish on every cast. I actually missed some really nice photos opportunities but who has time to pose for pictures when the fish are chewing on every cast. 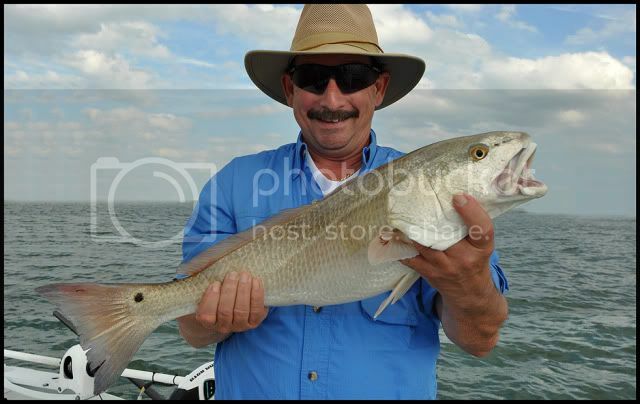 Most redfish caught were in the 7-11lb. range. Who says you can’t catch fish on windy days! Here are some pictures of the smallest fish of the day. Do not let the wind keep you off the water and use it to your advantage when fishing. Set up from your target up wind, keep the wind to your back, cast with the wind and gain extra distance on your cast keeping you further away from spooky fish. I bet you can get an extra 60-80 ft. on your cast with this technique which will end up producing more fish. was all Jim Hogan and I could do as the water clarity has now settled to its darker tannic color. 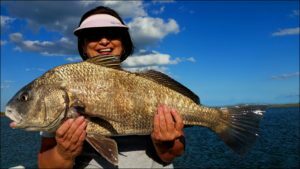 At times we could see a redfish lying around an oyster or swimming but the trick to sight fishing was actually reading the water. We could see the reds pushing wakes in the early morning hours while fishing St Augustine and surrounding flats. We used live shrimp and mud minnows but this time of year the reds would eat just about any lure that swims past their nose, some of my favorites are gold spoons, Fishbites soft plastics and Sebile stick shadds. Start early and beat the wind, smooth glassy early morning conditions is a great time to wake the redfish up with a topwater lure. Zara spook Jr., Top Pups and Skitter walks are great surface walkers that will attract the fish by their “click, clack” sound produced. 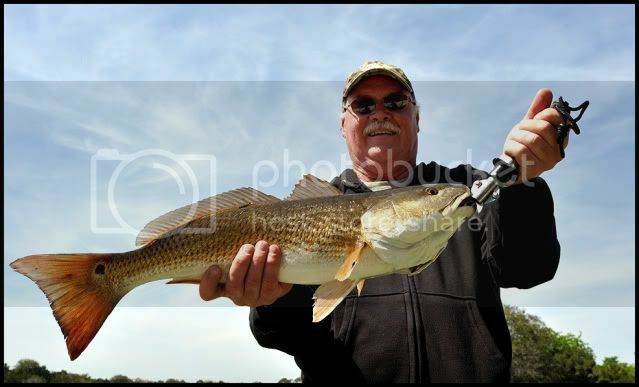 Remember not to set the hook until you feel the weight of the fish as redfish will consistently miss the plug. 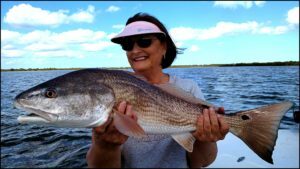 Last Days OF Sight Fishing…..
were spent with George and Don as we headed out mid morning for some redfish action. We started by fishing St Augustine’s shallow water flats in search of last chance schools that we found with out a problem. 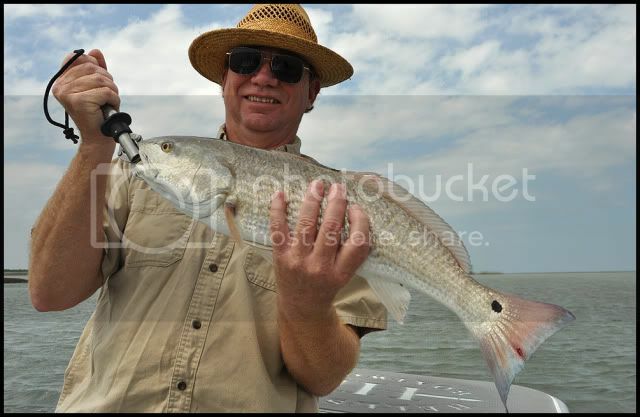 Shallow water glassy conditions is the ideal conditions to sight fish redfish and that’s the conditions we had. We not only physically saw the redfish but could see them “pushing” wakes in the distance. A properly placed live shrimp on a Daiichi 1/0 circle hook would result in a caught fish. After the charter the guys took their catch to JT’s Seafood Shack where fresh blackened redfish was the main course. With the water clarity starting to diminish its time to break out the “search lures”. Search lures is a term given to lures that cover water quickly like gold spoons, topwater plugs, inline spinners and spinnerbaits. These lures are great for stained waters because of the flash, vibration and noise they produce to attract fish on the flats. 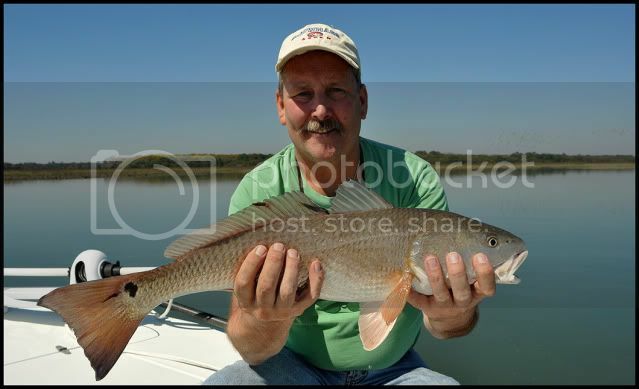 live bait fisherman searching for redfish should soak cut bait like mullet, pinfish or ladyfish around oyster beds where redfish can pick up the scent. Stop by and say hello to Capt. Chris Herrera from Palm Coast Fishing as he will be in answering questions and showing inshore rigs that will help you catch more inshore fish at the Fort Lauderdale Bass Pro Shops Feb. 25 and the 26th.